We’d love your help. Let us know what’s wrong with this preview of Untreatable by Jennifer Laslie. Tahlia’s ancestors refused the cure, escaping to live in the wilds of South Dakota. When she’s captured on a supply run, she becomes a lab rat for the scientists searching for an antidote to reverse the damage. Quentin, the son of the doctors wanting to dissect Tahlia, knows the fate of humanity lies buried in Tahlia’s genetic code, but her survival also lies in his hands. Will his choices doom the human race? To ask other readers questions about Untreatable, please sign up. This is a great book! You might ask why I only rated it four stars then. Well, it's obvious that I know this lovely author that is my wife, and I don't want anyone thinking that I'm just blowing smoke. This is a true critical review. This topic, as far as I know, hasn't been touched in the past. There was a passion that engulfed her while writing this that I was able to see, but I think that you will more than feel as the story progresses. Tahlia and her people are hiding from the world. Years a This is a great book! You might ask why I only rated it four stars then. Well, it's obvious that I know this lovely author that is my wife, and I don't want anyone thinking that I'm just blowing smoke. This is a true critical review. Tahlia and her people are hiding from the world. Years ago America found a cure for obesity, which in turn helped with so many diseases. They found a way to increase the metabolism of everyone, as it was forced on the entire populace of the world to "save" the population from themselves. The Lakota Sioux went into hiding as they knew the government had no right to tale away from them more than they had their ancestors. They survived on their own, in hiding, while the rest of the world around them fell apart. Quentin lives in the city and is the son of two brilliant scientists that are trying to find a cure to the cure. Each generation the metabolism increased drastically to the point that people couldn't eat enough to survive. There were things that could be done to slow things slightly, but only the higher class could afford such treatments. After a hundred years there seemed to be no hope of finding a cure. The only way would be to find someone that was descended from someone that didn't receive the initial treatment. Treatment was mandatory though, so how could there be anyone? This had one of the most unique concepts I have ever read. It definitely sparked my interest from the very beginning. In an attempt of curing obesity, the human race created their own demise and it was a treat to see how they got out of it. I wish I could've given this a higher rating but the characters were a tad too young for me and there was a case of insta-love for a couple of them. The love triangle, I could've done without. It didn't really add to anything. I wish the author had spent more focus on the facility making them a lab rat instead of the unnecessary love triangle. For the characters being so young, they use vocabulary that I've heard nobody their age use. That didn't help in the belief department. I think I am growing weary of rescue missions. Nothing to do with this book, just something I have been noticing and sadly, this is one of those. I wanted to like the protagonist but I just couldn't. Her actions and dialogue just... didn't seem believable to me. Also, she yelled too much. I felt bad for the guys that had to hear it. Some of the challenges that arose were solved almost instantaneously and I saw too many things coming miles away. All of this took away too much from my experience. 100 years ago the USA created a formula that made obesity extinct. Selling it to other governments, America was top of their game. Whilst it was a miracle at the start, people began to waste away, and eventually there was not enough food to satisfy them. However some groups did not trust the government and went into hiding. Now society is dying out and scientist are trying to find a cure. One group that went into hiding was the Lakota Sioux. Living off the land, their generations thrived in a hea 100 years ago the USA created a formula that made obesity extinct. Selling it to other governments, America was top of their game. Whilst it was a miracle at the start, people began to waste away, and eventually there was not enough food to satisfy them. However some groups did not trust the government and went into hiding. Now society is dying out and scientist are trying to find a cure. One group that went into hiding was the Lakota Sioux. Living off the land, their generations thrived in a healthy environment. Tahlia was one of their offspring. She loved her life but wanted to do more, so was excited to go on a supply run to the nearest town. Knowing it would be dangerous, still did not stop her excitement. Tahlia was quite naïve as she was sheltered in her tribe, but when her and her tribes lives were in danger, she became a completely different person. She was strong, determined and brave. A lot of that was down to Quentin, the son of the scientist who were trying to find the cure. One of the rich kids who had everything but what he wanted love. He was not afraid to put himself in danger. Together they were a great team. A hundred years ago scientists came up with a cure for obesity and the government made it mandatory for all citizens. Most but not all of the people believed or trusted in the cure so they took off into the wilds of South Dakota hiding from the government so they would not have to take the drugs. They lived in the woods and depended on Mother Nature to help them survive. They grew their own food and canned it in jars hoping I received a free copy of the book from the author for my honest opinion. A hundred years ago scientists came up with a cure for obesity and the government made it mandatory for all citizens. Most but not all of the people believed or trusted in the cure so they took off into the wilds of South Dakota hiding from the government so they would not have to take the drugs. They lived in the woods and depended on Mother Nature to help them survive. They grew their own food and canned it in jars hoping they would have enough food to last them through the winter months. They also traded with other tribes who lived in the woods but sometimes they would have to send runners into to the cities for supplies that they couldn't get living in the wild. Tahlia and her mother had their own tent that they lived in and shared. But Tahlia was at the age where it was time for her to look for a mate to spend the rest of her life with. But Tahlia's tribe had this little problem where there was only girls being produced so therefor that left Tahlia and all of the rest of the girls her age without a man. The only men in their tribe were either already taken or too old for them. Tahlia thought that they were going to have to start looking for mates in another tribe. With Tahlia's tribe being short on young men and with their supplies running low that only left the girls to become "runners". Tahlia had always wanted to go into town to see if all the things that she had heard over the years were true. So she was very surprised when her mother agreed to let her become a runner and join some young men from another tribe and make the long trip into town. She was one happy girl to be given a job that was so important and dangerous at the same time. Quentin lived in this town that Tahlia and her new friends; the runners were going to get their supplies. They had to be real careful not to get caught by the guards in the city. If they were caught then they would be taken and experimented on by scientists who are trying to find a cure for the cure. The cure didn't actually help the people lose weight all it did was cause their bodies to need food more and more. The poor people couldn't afford all the food they needed to live while the rich folks were able to obtain all the food and supplements that they needed to maintain a healthy weight so they could live. Quentin may have had all the food and supplements that he needed to stay healthy but he hated his life. He couldn't wait until the day came when he could escape living under his father's roof. He wanted to be on his own and live his life the way he wanted not like his father wanted. His father didn't care about him all he cared about was himself and his job and maybe Quentin's mother. This was definitely a different read for me, but I ended up enjoying the story. 100 years ago the US found a cure for obesity, but this cure is killing today's generation. Tahlia and her tribe never took this cure and have been living off the land in the wilderness this whole time. Since they never took the cure, the government wants to run test on her and her tribe to find a cure for the cure. When Tahlia is taken during a run into town to get supplies to store their food for the winter, she is f This was definitely a different read for me, but I ended up enjoying the story. When Tahlia is taken during a run into town to get supplies to store their food for the winter, she is found and taken. While in the government facility she meets Quentin. Quentin is the son of two of the scientists looking for the cure. He finds Tahlia locked up and frees her and leaves with her, as he is now a criminal and wanted by the government. I love watching the journey Tahlia and Quentin have getting to her home and even having to rescue her tribe. O when I was asked if I read apocalypse type of books, my heart beat a bit faster. Immediately I thought ZOMBIE!! But then Jennifer told me about her book (not zombies) I was like “huh. Interesting idea” . So essentially the US Government came up with a “cure” for obesity that worked initially but later generations were dying because their body genetics were allll outta whack from the “cure”. So we met Tahlia who is a Native American living with her tribe. They are essentially hiding out from the government. They government wants to do experiments on “healthy untreated” people. Tahlia’s tribe and neighboring tribe go to the city to loot for supplies when she is caught. Bad news right?? Quentin is the son of the Government Big Wig who is looking for a cure. He hates his life and is excited at the thought of leaving his terrible life behind to save this beautiful woman. During the travels to save Tahlia and her people, I loved seeing Tahlia and her people’s reaction to common everyday items like fire extinguishers and the movie theater. The book is a really cool read. It was like the maze runner and the hunger games all wrapped up in a cool YA novel. There were a lot of twists and turns plus deception and angst. I loved the epilogue and what happened to the people who were in the book. Tahlia just wanted to live will her people in freedom, but when she goes on a supply run she is captured by the government who is desperate to find an antidote to the cure for obesity they took more than 100 years ago which now is killing them by raising their metabolism so high they are literally starving to death. Quentin hates everything about his father but is forced to rely on him, however when he finds Tahlia and learns his father means to experiment on her he knows there are worse things Tahlia just wanted to live will her people in freedom, but when she goes on a supply run she is captured by the government who is desperate to find an antidote to the cure for obesity they took more than 100 years ago which now is killing them by raising their metabolism so high they are literally starving to death. Quentin hates everything about his father but is forced to rely on him, however when he finds Tahlia and learns his father means to experiment on her he knows there are worse things than staying and pretending ignorance. Helping her may cause his death but he knows it's the right thing to do. Tahlia is strong and loyal to her people and will do anything to help and protect them. She tries to see the best in people, but is willing to make the difficult choices if they prove they aren't. Quentin could have grown up feeling entitled and spoiled, but instead is kind and compassionate, willing to do they right thing even if it is difficult. These two are young and a bit idealistic growing up in the world where one knows all about technology and the other is all about nature, but together they find a new path to help as many people as possible. I've read quite a few dystopian novels, and although this is obviously a favorite genre of mine, the same general plots seem to pop up again and again. So when I picked up this one, I was really excited to see a new twist to things. Untreatable hits on a topic which addresses a very modern problem - obesity. I found the idea that a government would see this as a disease and try to cure it with a forced immunization an interesting twist. And that mankind would then start to kill itself off becaus I've read quite a few dystopian novels, and although this is obviously a favorite genre of mine, the same general plots seem to pop up again and again. So when I picked up this one, I was really excited to see a new twist to things. Untreatable hits on a topic which addresses a very modern problem - obesity. I found the idea that a government would see this as a disease and try to cure it with a forced immunization an interesting twist. And that mankind would then start to kill itself off because of increased extreme under-weight problems really makes one think. But going beyond this new twist on the possible end of the world, the story itself was well written and had me eagerly turning one page to the next. The characters are easy to love and cheer for (or in the government's case, dislike). We get enough into the characters heads to understand their emotions as well as the reasons behind the decisions they make. There's a sweet romance, which doesn't over-power the main story line, but adds a great amount of humanity. Summed up, this is a refreshing dystopian with all the action, intensity and emotion such a story needs. I picked it up and had no trouble staying with it to the very end. This book shows a unique view of the growing obesity problem. Obesity is a billion dollar business. In this book, a cure has been found. Tahlia and her people refused the cure and now are in hiding. Those that sought the medical cure now find that they are dying. A trip into the city takes a dangerous turn. This book quickly grabs your attention and keeps you turning pages to follow the twists and turns of the storyline. This is a definite book to add to your must read list. Government decisions and people in power almost kill of everyone. Romance, drama, and suspense fill this story. This sums up with a nice little bow at the end. I recommend this as a great read. Awesome read!! This take on the "end of the world" was very believable and I could see this happening. More people should read this. 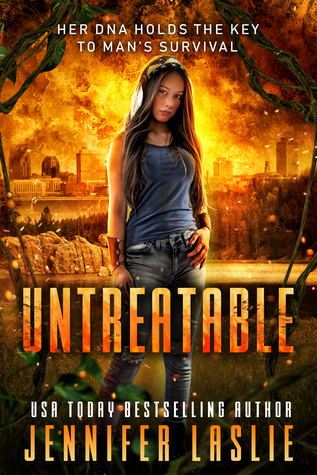 Untreatable is up for pre-order at $0.99! Grab it now before it goes up to $3.99 on release day! I really enjoyed this story and how it played out. I would definitely read more from this author. Good job! Citizens of the U.S. are starving to death 100 years after a government-mandated "cure" for obesity. Few people escaped the genetic mutation, and they are now being hunted for their untainted DNA. Tahlia and her tribe are just trying to survive, which means staying hidden. While out on a supply run, Tahlia is captured. She meets Quentin, the son of the very doctor who wants to use her as a lab rat. Can she trust Quentin with her life, as well as the lives of those she cares for? Can Tahlia save Citizens of the U.S. are starving to death 100 years after a government-mandated "cure" for obesity. Few people escaped the genetic mutation, and they are now being hunted for their untainted DNA. Tahlia and her tribe are just trying to survive, which means staying hidden. While out on a supply run, Tahlia is captured. She meets Quentin, the son of the very doctor who wants to use her as a lab rat. Can she trust Quentin with her life, as well as the lives of those she cares for? Can Tahlia save them all, or will she die trying? This book offers a unique take on the typical dystopian novel. There is a bit of suspense mixed in, as well as a love triangle, not to mention the obesity angle (which is not a common topic in books of any genre). The pace is generally steady throughout, though there are a few lulls. The story is told in alternating POV's, and the author adds in just the right amount of teen drama and angst. An interesting and scarily believable future scenario, dramatically brought to life, with a strong positive central character in Tahlia. Set in a not so distant version of the USA, Tahlia is living in secret on her tribal lands, while most of the population is suffering the deadly consequences of an attempt to cure the obesity epidemic by creating a medication to speed up metabolism. When the unintended side effects become apparent in the next generation, the hunt is on for uncontaminated bloodl An interesting and scarily believable future scenario, dramatically brought to life, with a strong positive central character in Tahlia. Set in a not so distant version of the USA, Tahlia is living in secret on her tribal lands, while most of the population is suffering the deadly consequences of an attempt to cure the obesity epidemic by creating a medication to speed up metabolism. When the unintended side effects become apparent in the next generation, the hunt is on for uncontaminated bloodlines, and Tahlia and her people become targets. This book was such a different and unique read. I love dystopian stories and this one was amazing. I loved the story line and the characters were well thought out. I just wished that the book was a little more polished. I really enjoyed the writing style, it kept me engaged and I also loved the sense of humour in the book. Overall, a enjoyable dystopian read with a twist. Well, it is about time someone wrote about the obesity crisis in the world's population but especially here in the United States of America! J. Laslie transports us to a not too distant future where obesity has been eradicated at the cellular level. However with all miracle cures there is a price to pay. One hundred years in our future a "government-mandated cure" for obesity is causing starvation among the surviving population of the United States. Those left in the city are required to eat larg Well, it is about time someone wrote about the obesity crisis in the world's population but especially here in the United States of America! One hundred years in our future a "government-mandated cure" for obesity is causing starvation among the surviving population of the United States. Those left in the city are required to eat large amounts of food and take supplements to help keep them alive or so they have been told. Those who escaped and fled to the untouched wilderness of America are now being hunted for there untainted DNA to cure the "cure." Those who are left untouched by the mutation live their lives away from the city and struggle to survive. However there are times when even they must venture to the city for things they need to survive. It is on one of these "runs" that Tahlia meets Quentin. Tahlia is captured and Quentin, the son of a prominent doctor rescues her and they both flee the city. Upon return to her village Tahlia discovers that her family has been taken by the guards in the city. Together with Quentin and members of another tribe, they return to the city to save her family. I give this book a 4. I admit it is mainly because the premise of an obesity cure and what really happens picqued my interest. The story is well written and keeps one interested. The story is told in two person perspective. Each chapter told by Tahlia and Quentin which I found to interesting. "It must be hard living out in the wilderness with no modern technology, " Quentin added. "I like it, it's peaceful. I felt so trapped in your buildings. Like I was being suffocated! I'd rather live among the trees, grass and animals. I love the fresh air, warm sun, and shining stars in the sky." We have a world where those that took the quick fix ended up dying due to just able to keep there metabolism in control so of course the evil government decided they needed to find those that didn't take the quick fix and their families to figure out a cure. Well of course being the government you know there not asking the unaltered to just volunteer but instead pretty much hunt them down and torture them along the way since the untreated are hiding and living off nature. Jennifer Laslie is a crazy cat lady who lives in Louisville, KY with her wonderful husband and two children. When she's not thinking about cheesecake or cats, she can be found in the bookstore in the Young Adult section, coffee in hand.